I have not been in trained chart rectification, the art of producing educated guesses about the birth time of a person or entity based on biographical details. Nevertheless, in the course of astrologically "poking around", a potential birth time for Jordan B Peterson has come to my attention. Peterson has no significant planets in the 16-19 degree range of the cardinal signs. I'm fairly convinced that he would, then, have to be born with one or more angles (or the Moon), based on precise birth time, in that same degree range. He has clearly experienced the effects of a Pluto/Uranus hard transit with his recent catapult into fame and notoriety. This, in my experience, is most consistent with a Pluto-to-angle transit. So this one consideration allows us to focus on potential birth times with 16-19 cardinal on one or both of the axes. The Moon in Libra is on his Ascendant, suggesting a person whose primary activity may be nurturing/fortifying others. 18 Libra rises, fulfilling the condition of an angle at 16-19 cardinal. Uranus-Pluto in the 11th House: a disruptor of societal norms. North Node in Leo in the 10th House: increasing prominence with age. Venus in Cancer is conjunct the MC, again with the nurturing theme, but also suggesting a representative of culture (Venus). Sun/Mercury in the Ninth House: consistent with being a college professor and philosopher. Pallas in the Eighth at the midpoint of the MC and Jupiter, quincunx the Ascendant. This helps explain both his his prowess in psychology (Pallas/Eighth) and his very high recorded IQ (Pallas with Jupiter and the angles). Seventh House ruler in the Seventh square the nodes and Saturn: consistent with how Peterson speaks of marriage as a deep, yet necessary, challenge. Jupiter rules the Sixth House of workplace and is close to the cusp in the creative sign Pisces, sesquiquadrate Venus (representing aesthetics): Peterson tends to cover his offices wall-to-wall in art. Jupiter and Chiron in the Fifth: he has one aggressive/assertive child and another with significant health issues. This astrologer has a client with the same conjunction in the Fifth, who also has two children with similar traits. The progressed Moon will have recently crossed over into the First House, suggesting increased action/prominence. Chiron will have recently crossed into his Sixth House, reflecting recent shifts in his health. Uranus will have recently moved into his Seventh House, reflecting his sudden fame and much-increased social interactions. The South Node is in the Fourth House (culturally liberal tendencies) and Neptune is near the Second House cusp (an economically liberal vector): Peterson self-identifies as more Left than Right. Progressed Ceres is conjunct his MC: Peterson has just started a sabbatical. This, for me, is a big one as Ceres is a consistent indicator of when things or people are "taken away". 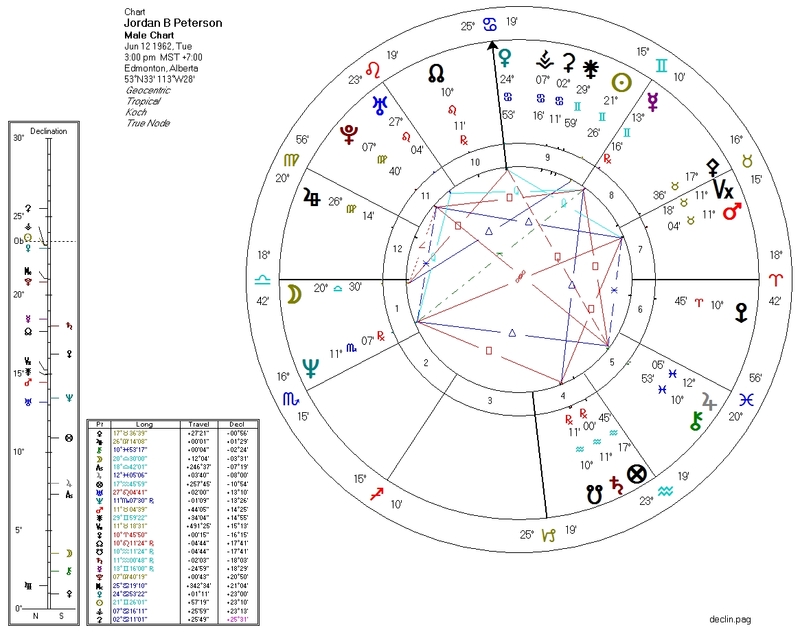 On Sep 27 2016, when Peterson launched the first video attacking Canada Bill C16 and began his ascent into fame, transiting Mercury was conjunct his progressed MC, Sun/Jupiter was square his solar arc Mars in his Ninth House, and the transiting Moon was conjunct his 11th House Uranus. It's still entirely possible he was born at a different time, but for the time being I'm going with 3pm or thereabouts for Jordan Peterson's birth time. Feel free to chime in with a better idea -- I am, as always, open to constructive comments.